The NASA Short-term Prediction Research and Transition (SPoRT) Center has developed a Real-Time Land Information System (LIS), using satellite-derived datasets, ground-based observations, and model reanalysis to inform weather models with influences from the land surface. Volumetric Soil Moisture represents actual moisture in a soil column. Relative Soil Moisture represents the soil moisture for a given soil column on a relative scale between soil saturation and wilting levels. Column-Integrated Relative Soil Moisture combines 4 column depths down to 200cm. Green Vegetation Fraction-current and trends-from VIIRS. Land surface temperature and Heat Flux. 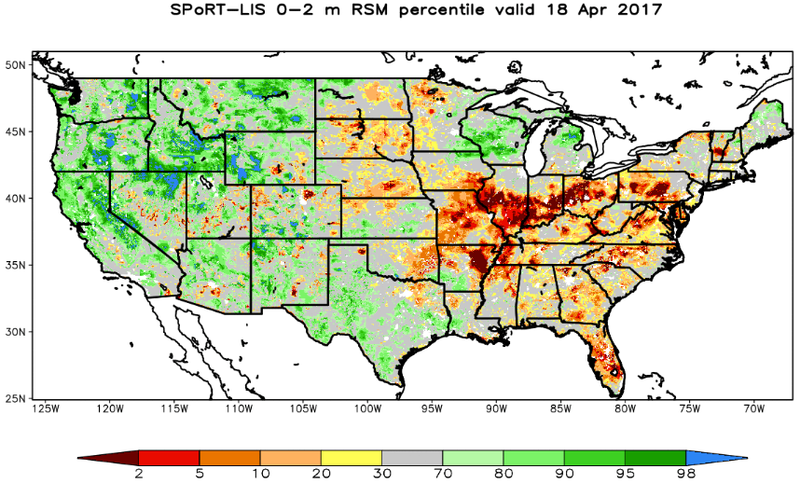 Column-Integrated Relative Soil Moisture products to assess current drought levels and changes over one week, two weeks, one month, three months, six months, and one year. Green Vegetation Fraction products that are updated daily in lieu of NDVI that are updated on only a weekly basis. Current conditions are augmented by 1-month, 2-month, 3-month, 4-month, and 1-year change products. Relative Soil Moisture products that may be correlated to fuel moisture contents applied in fire effects and fire spread models. A 0-10 cm 1-day change product provides an assessment of rainfall effects on the top soil layer that relates to fuel moisture in carrier fuels.